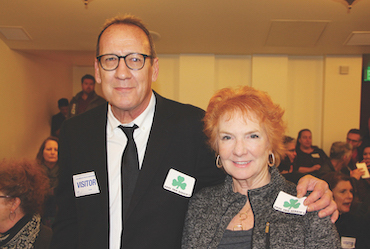 KEN HIXON and Mary Woodward sport “Save Tom Bergin’s” badges at the Cultural Heritage Commission meeting. Room 1010 at City Hall was full last month when the members of the Los Angeles Cultural Heritage Commission voted unanimously 5-0 to recommend Historic Cultural Monument (HCM) status for Tom Bergin’s Bar and Restaurant. Ken Hixon, of the Miracle Mile Residential Association, and Adrian Scott Fine, of the Los Angeles Conservancy, presented a case supporting HCM status. They had filed the original application for HCM status in September 2018. At the packed hearing, the few people who spoke against the historic recognition for Tom Bergin’s included Derek Schreck of Vintage Vices, LLC, the most recent owner of the bar and restaurant, and his father, Frank Schreck, as well as various parties favoring a proposed resale of the property to next-door neighbor Shalhevet High School. The nomination’s next step is consideration by the Los Angeles City Council’s Planning and Land Use Management (PLUM) committee. If approved by the PLUM committee, the Cultural Heritage Commission’s unanimous recommendation will be sent to the full city council for consideration. Tom Bergin’s originally opened in 1936 on Wilshire Boulevard. It was moved to 840 S. Fairfax Ave. in 1949. It has been in near continuous operation since. The current owner / operator closed Tom Bergin’s after St. Patrick’s Day in 2018.